Enjoy a full day of fun with your own chauffeur and executive black Sedan or SUV taking you from your hotel/residence in San Francisco to zip lining and horseback riding in Sonoma County with a stop in between for a lunch in scenic Russian River Downtown. (On the way to the zip lining location, we are more than happy to stop off at the North point of the Golden Gate Bridge to take photographs of your group and the bridge!) Your day starts with your assigned chauffeur arriving at your doorstep or hotel in San Francisco and whisking you away to Sonoma Valley forest zip lining, followed by a stop for lunch in Russian River's downtown which is full of fabulous restaurants and shops in Healdsburg. After this, your group is on to a scenic horseback ride experience second to none, with breathtaking views of Dry Creek Valley. Once finishing up for the day, your group will be driven back to your hotel/residence in San Francisco. DURING HIGH SEASON : JUNE-SEPTEMBER . MUST BE BOOKED 5-7 DAYS IN ADVANCE. The details that concierge will go over with you consist of the following: Pick up time, preferred location (if not your hotel or residence listed), picking your zip line track, horseback trail and choosing your group's ideal stop in Russian River downtown for lunch, shopping and walking around. Once being dropped off at the zip line facility, your group will be greeted by the zip line staff and operators, who will then take you through all preliminary safety briefings and tutorials before letting you go through the zip line courses. 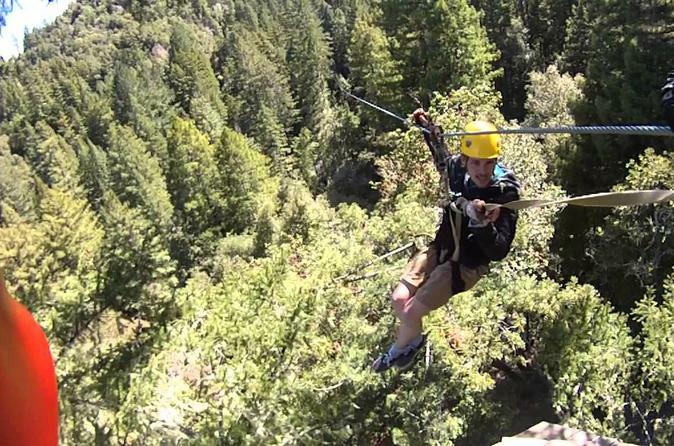 Your group will get to enjoy hours of zip lining up on a canopy course of your choice. Fresh forest air in Guernville and scenic zip lining is something you can certainly look forward to when taking up the canopy courses! Your driver will be awaiting your return at the end of the ziplining track. Upon text or phone call, your driver will be ready in just moments to greet your group. In between zip lining and horseback riding destinations, your group will be taking to the cute downtown of Healdsburg for lunch and shopping, if desired. Healdsburg is home to dozens of great restaurants, boutique wine tasting rooms and quality shopping! After lunch in downtown, your group will be taken to North Sonoma county for scenic trail horseback riding. You will get to spend anywhere from 20 minutes to 90 minutes on horseback in Russian River Valley. Once being dropped off at the ranch, your group will be greeted by the ranch staff and operators, who will then take you through all preliminary safety briefings and tutorials before letting your group gets geared up and ready to ride. Your group will get to enjoy your pre-selected scenic trail of valleys lakes and mountains. The stable takes pride in their Yosemite raised horses that superbly handle Dry Creek Valley. The breathtaking views and scenery of Dry Creek Valley trail will have be the perfect finishing touch to a full day of activity. Available at the horseback riding ranch is also a wine tasting bar and a lovely kitchen for guests to enjoy everything and more! After finishing horseback riding, your chauffeur will take you back to San Francisco at the initial pick up location, unless directed otherwise by the group or a member of the group.